Fire. Tornado. Flood. Product recall. Power outage. How will your company effectively communicate with employees and customers if a crisis occurs? Do you have a plan? Does it include social media? It should. In June 2011, a volcanic ash cloud disrupted international airline service for thousands of travelers. Qantas Airlines effectively used social media to keep travelers informed of the ongoing crisis. Customers quickly discovered that contacting Qantas via social media provided prompt, accurate information and was a more pleasant experience than waiting through long telephone queues to speak to a company representative. Effective crisis management demands thorough communication. Twitter and Facebook are must include components, especially now that both accommodate the use of hashtags to connect conversations. Crisis Management blogger Melissa Agnes recently detailed the importance of hashtags. Consistent use allows your company and customers to monitor conversation threads for all updates and help requests as well as information that should be shared and retweeted. Companies that use social media effectively during a crisis post regular updates containing pertinent information. Examples include letting customers know when the business will reopen or how they may obtain a refund for a recalled product. Remember to maintain a positive tone in all your crisis communications. Sometimes that’s easier said than done when receiving criticism. But resist the urge to go negative. You won’t regret it. Respond immediately to comments and replies. Use the opportunity to repeat your message. Once the crisis has passed, remember to thank your customers for their patience. Consider offering a limited-term coupon to reward loyal customers. While all these tips are helpful, the most important advice is to develop your social media strategy for crisis communication now, before you are in the midst of a crisis. I’m interested in hearing from you. Has your company faced a crisis? Was your communications plan effective? Why or why not? Please post your comments below or post send us your thoughts on facebook and twitter #crisiscomm. Thanks for referencing me and my article in your post. Great info here! Thanks, Melissa. 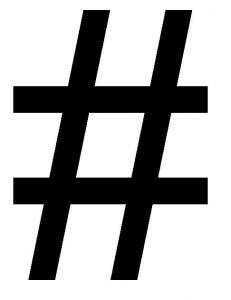 I thought your advice on #hashtags was spot on and worth sharing. To me, Twitter is an amazing tool to find out what is happening. Hashtags help me find the information I seek.